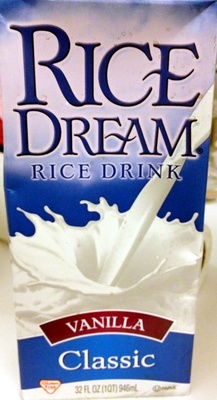 Brands: Rice Dream, The Hain Celestial Group Inc.
FILTERED WATER, BROWN RICE (PARTIALLY MILLED), EXPELLER PRESSED HIGH OLEIC SAFFLOWER OIL AND/OR SUNFLOWER OIL AND/OR CANOLA OIL, NATURAL VANILLA FLAVOR WITH OTHER NATURAL FLAVORS, SEA SALT. Product added on May 15, 2013 at 3:18:48 PM CEST by openfoodfacts-contributors. Last edit of product page on March 10, 2017 at 11:50:16 AM CET by usda-ndb-import. Product page also edited by bdwyer, tacinte, upcbot.